For more than 15 years, Rehmeyer Wood Floors has been creating high-quality wide-plank hardwood flooring for homeowners across the nation. Based in York County, Pennsylvania, our family-owned business rolled out our very own line of pre-finished stock floors to make it easier than ever to own a Rehmeyer wood floor! Many of our customers typically appreciate the option of creating their own Extreme Custom design or choosing from among our Custom Collections. While there’s nothing like a truly custom look, we realize that sometimes the timeliness and simplicity of ordering a prefinished stock flooring is the best option. Like all our floors, our “Complete Collection” of stock flooring is comprised of 3/4” solid hardwoods and is finished using time-honored traditional methods of milling and finishing premium lumber in order to get you the best solid wood flooring possible. We like to call it our “Complete” Collection, because it comes completely ready for installation. 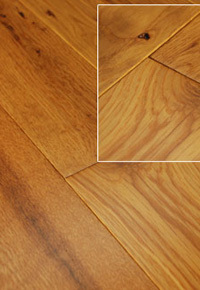 We keep the following five varieties of tongue-and-grooved, end-matched flooring in stock and ready to install. 1) The rustic look of Charleston Red Oak provides the ideal foundation for a traditional looking design. 2) If rustic charm is the look you desire, our authentic Sedona Cherry has the kind of natural vibrancy that gets richer over time. Our finishing process protects and enhances the lumber’s natural beauty. 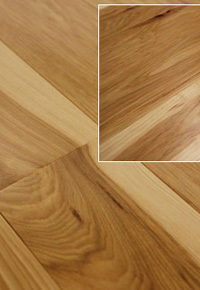 3) For those who want a natural-looking rustic feel, Island Sand Hickory is an excellent choice! Our finish showcases the natural beauty of this character-grade lumber. 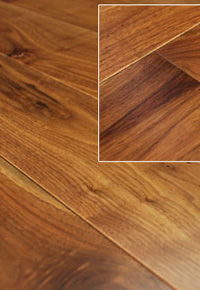 4) If you want to create an upscale, elegant ambiance, our Milano Walnut flooring is an ideal choice. The character-grade unsteamed Walnut provides the perfect backdrop for your formal space. 5) We refer to our White Oak flooring as Harvest Wheat because the finished product showcases the lumber’s light golden coloring. 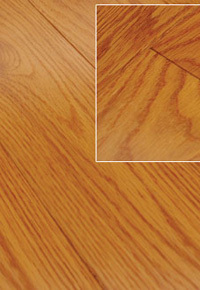 All our prefinished stock consists of solid hardwood that’s tongue-and-grooved and end-matched. Lengths vary from 12 to 84 inches, and widths include 3-inch, 4-inch, or 5-inch options. Small, micro-beveled edges and ends provide just the right finishing touch, and tung oil finishing is available. For your convenience, each grouping of random-length planks comes packaged in boxes that are easy to transport and store. For a custom look, you can add accessories such as matching floor vents to your order. We can match the particular style of your vents with any of our lumber species. Simply measure the duct openings and communicate the dimensions with us when you place your order. Here at Rehmeyer, we pride ourselves on providing quality craftsmanship and personalized service with integrity. You can contact us at (888) 474-4047 to place your stock flooring order today. Hardwood flooring gives luxury and comfort for a home. It’s an ideal option to design a home to be more natural and for a traditional looking design. It’s widely available and perhaps almost every home has the same designs. So, creating your own custom designs will make your home looks different and stand out from the crowd.